A wind turbine, like an old-fashioned windmill, captures kinetic energy from the wind and uses it for another purpose. In modern times, the energy is converted to electricity. Large wind turbines are positioned on the top of tall towers built in favorable locations, and they harvest large amounts of electricity. A home wind turbine is a much smaller version that generates enough electricity for household use. Typically, a home cannot rely entirely on the energy produced by a home wind turbine. If wind speeds are low, the turbine will not generate electricity, so most homes are also connected to a local utility service. When wind speeds are very high and the wind turbine generates more electricity than the household needs, it may be possible to sell the extra power to the utility company. Although it is possible to store electricity in batteries, most home systems do not store it. In most cases, a home wind turbine should be placed at least 30 feet (9 m) higher than any nearby object. Home turbine systems are often installed on small towers. Homeowners should check all local ordinances before purchasing one. Using a wind turbine usually reduces a home electricity bill from 50 to 90%, but the long-term savings depend on many factors. A house located in an area with a high average wind speed will generate more electricity from a turbine than one in area with light breezes. An all-electric home can use more of the electricity than one that also uses other kinds of power. 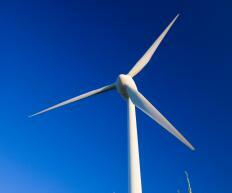 Installation costs vary, but a home wind turbine usually pays for itself in six to 15 years. Installing a home wind turbine is good for the environment. It produces no pollution and reduces the demand for electricity produced by methods that do pollute. A wind turbine does create some noise, but it is not extremely loud, and many models never get noisier than 35 decibels. What is a Wind Speed Sensor? What is an Impulse Turbine?